Southern California pelagics have a lot going for them. Pleasant weather and calm seas usually combine to make an enjoyable day on the water, and great distances need not be covered to reach decently productive waters. In summer, Black-vented Shearwater, Pink-footed Shearwater, and Black Storm-petrel are in great supply, and rarities such as Least Storm-petrel, Craveri's Murrelet, Guadalupe Murrelet, Blue-footed Booby, Red-footed Booby, Red-billed Tropicbird, and the newly split Townsend's Storm-petrel can appear at any time. Brown Booby, though once rare in SoCal, is virtually guaranteed on any San Diego or Orange County trip, so if you still need that bird for your ABA list, a SoCal pelagic should be in your future. All that said, I've now taken 6 SoCal pelagics - 2 from San Diego, 2 from Dana Point in Orange County, and 2 from Oxnard in Ventura County - and have yet to be blown away by any of them. Now don't get me wrong, I had a really nice time on each trip, but they have collectively lacked the excitement that has surrounded my equal number of pelagic trips from Monterey or Hatteras. The biggest difference, as I perceive it, is the volume of birds, or, more specifically, the lack of it. While I have at times been astounded by the number of pelagic birds at other offshore destinations, I have never felt that way in SoCal. There are usually a few shearwaters and storm-petrels buzzing about, but there are equally often painfully prolonged periods (i.e multiple hours) when few - if any - species beyond gulls and terns are observed. I'm not so much writing about diversity as I am total pelagic individuals. As an avid photographer, I'm stoked to shoot even the common stuff, but here in SoCal what birds are around generally don't come close enough to the boast for what I'd consider proper photography. Why I've managed nice pelagic photos everywhere but SoCal is as baffling as it is frustrating. What keeps me coming back to SoCal pelagics are the well-run trips, the on-board camaraderie, the always pleasant conditions, and the ever present chance that a home-run rarity will appear. As a fairly unabashed ABA lister (well, the lower 48 at least since I haven't done Alaska - yet), I do want to add to my ABA list what pelagic species I can during my time here in SoCal. I figure that if I take a ton of SoCal pelagics, I'll see all the usual stuff plus a few rarities along the way. Many of the trips will be underwhelming, but I'll still see more than not going at all. This is why I say I have a love-hate relationship with SoCal pelagics; There is so much potential, but I know I'm going to have to take a lot of trips, many of them very slow, to find the rare birds that I want to see. Master of Ceremonies Dave Povey let's us know what's up! This past weekend I hopped aboard a trip of San Diego. I took the same trip last year, but missed my two target birds, Least Storm-Petrel and Craveri's Murrelet. I redeemed the storm-petrel in Monterey a month later, but the murrelet was still outstanding by the time our boat departed. That changed relatively quickly as we promptly found a number of Craveri's on the 9-Mile Bank. The first few pairs we so distant and the looks so poor that they did not meet my own "countable" threshold. However, with patience, we eventually got close enough to one pair for decent looks and record photos. We could even hear the two birds calling back and forth to one another. It was a really nice encounter and saved what was an otherwise slow trip. We had decent looks at the usual birds and a nice study of Leach's (Chapman's) Storm-petrels. This trip was a full 12 hours on the water and only cost $100. It was a really good value. Dave Povey and friends run a great ship; They have my full endorsement and will certainly have my patronage well into the future. 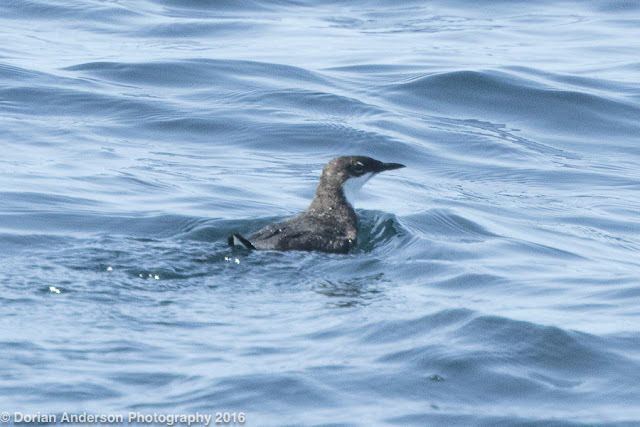 ABA seen #711 - Craveri's Murrelet! For those interested, here are some general SoCal pelagic links that might be of interest. http://www.socalbirding.com - This is the place for information on all San Diego trips. Discounts are given for advanced sign-ups, so look into the trips ahead of time. http://www.seaandsageaudubon.org/FieldTrips/Trips/Pelagic/PelagicTrips.html - Orange County's Sea and Sage Audubon Society runs 4 trips a year from Dana Point. 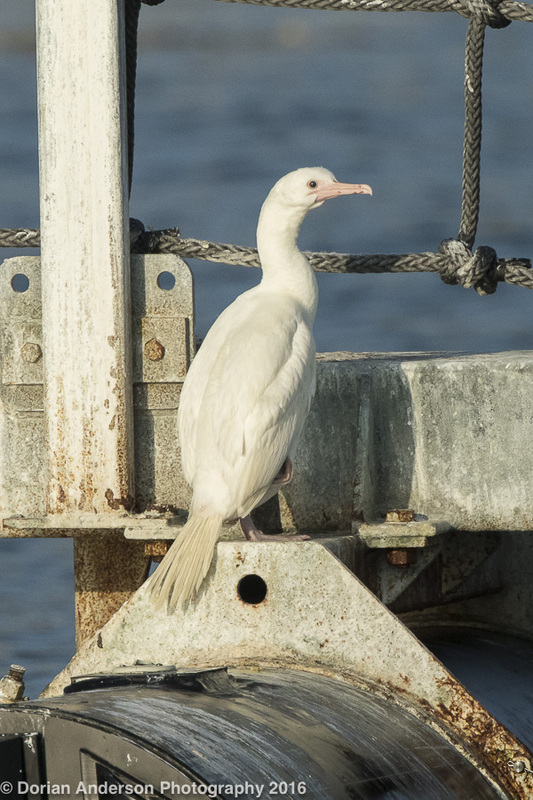 Mainly geared towards OC listers, they do find some great birds, Red-footed Booby, Craveri's Murrelet, and Red-billed Tropicbird included. These might be the best value in the history of pelagic birding at $60 for the 8-hour trip. I generally take a few of these trips each year since they're so convenient for me. http://www.bajawhale.com/wildlife-tours/pelagic-birding-tours/ - This is info on the famous 5-day "Searcher" pelagic trips. While I have not done this trip myself, I would imagine it is best for well-seasoned seabirders. These trips are expensive ($1300), but will give a person unparalleled access to SoCal's pelagic birds. All sorts of crazy stuff has been found on these trips (Pterodroma petrels included), so literally anything is possible. http://islandpackers.com/ - This outfit runs trip to the Channel Islands, most notable Santa Cruz Island where every ABA lister must go at some point if he/she want to collect Island Scrub Jay. 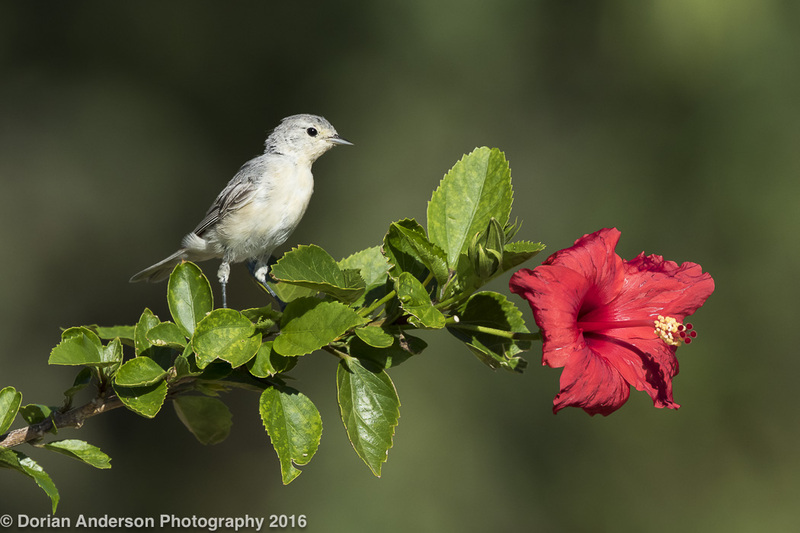 I took a combo pelagic and scrub jay trip with Island Packers back in February (you can read about that trip here) that was quite good. OK, that's it for now. Hopefully someone finds at least some of this helpful or informative! 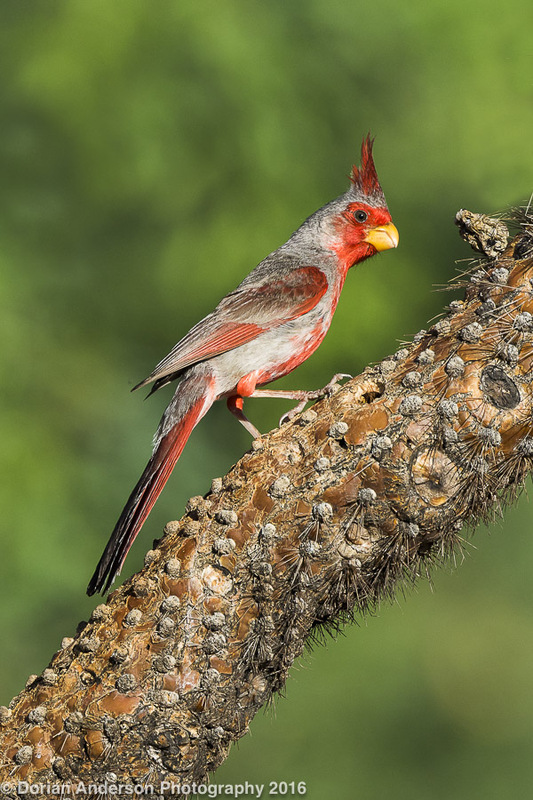 Most readers know that I am equally obsessed with birding and bird photography. As I enjoy both activities, I am much more of a "field photographer" than I am a "blind photographer"; I generally move about the world in search of my subjects while birding versus waiting for them to come to me in a blind. Many of the best bird photographers shoot exclusively from blinds, and for those folks rarity chasing and eBirding don't matter one bit. They are only focused on getting the perfect shot of the sought species. There are advantages and disadvantages of each strategy, but personal style and the desired subject dictate a lot. Shorebirds, for example, can't easily be lured towards blinds with food and as such must be sought more "in-habitat". Field photography is - in my mind - significantly more challenging, but blind and set-up photography certainly has a time and place, particularly when it comes to getting clean shots of passerines and hummingbirds. 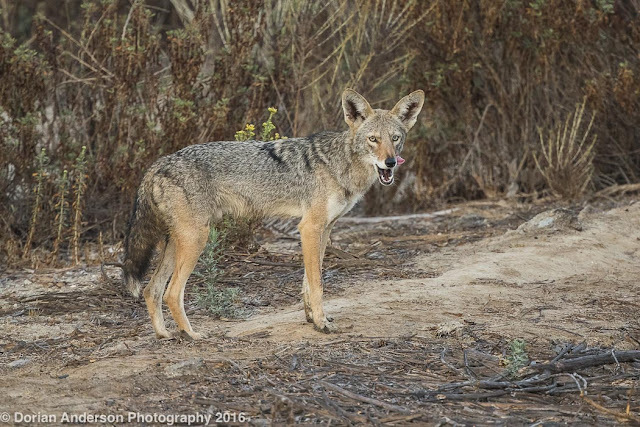 Anyway, with that as background, I decided to depart from my usual field photography ways to spend a few hours in a photography blind during my last morning in Arizona. After 4 days of hiking in the Huachucas (much of it in the rain), I decided I needed a break from birding. That last day was the only day with decent morning light, so I figured I would use it to shoot instead of bird/hike. Frustratingly, the nesting Tufted Flycatchers, completely absent during the 4 days I searched Ramsey Canyon for them, decided to reappear while I was shooting two hours away! UGH - them's the breaks. The shots I collected helped soften that otherwise very painful birding blow. Wow, what a week in Arizona! Our time in the Grand Canyon State was simply amazing! We spent 2 days in the Santa Ritas before passing the remaining 5 in the Huachucas, Hereford, and Sierra Vista where I was the keynote speaker at the Southwest Wings Birding and Nature Festival. Though on the smaller side (~140 people, I think), the festival was jam packed with field trips, lectures, and community outreach. 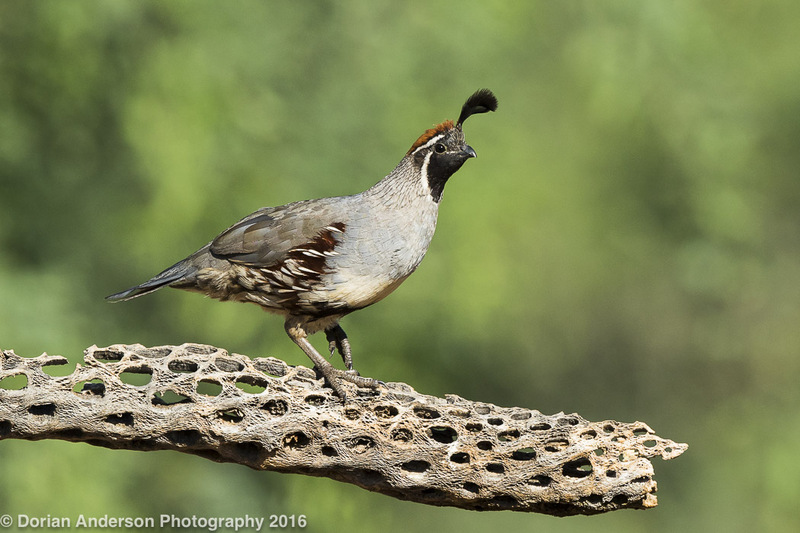 It was a very well-run affair and highly recommended for those looking for an introduction to birding in Southeastern Arizona (SEAZ). Incidently, SW Wings also runs a spring festival. Spring is generally better for nesting specialties, particularly nightbirds, while late summer features more hummingbirds and rarities. 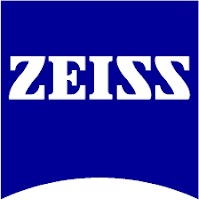 You really can't go wrong in SEAZ anytime between late-April and early-September, so don't delay if you're thinking about a visit! It is worth noting that July and August are monsoon season in the desert southwest; Clouds generally gather through the morning before dumping accumulated moisture as precipitation sometime in the afternoon. Cloudbursts can be heavy but rarely last very long. In that respect it's a bit like being in the tropics. As such, the rain usually doesn't disrupt birding terribly. Instead, the rain cools things down and induces a nice burst of late-day bird activity. Unusually, we experienced quite a bit of sustained rain during the first four days of our trip. We managed to get in at least some birding between downpours. The most notable bird for me was my ABA lifer Plain-capped Starthroat (ABA seen species #710) at the Santa Rita lodge in Madera Canyon. The continuing Tufted Flycatcher in the Huachucas, however, eluded me. It was completely absent on the 4 days on which I searched for it but reappeared the day that we returned to LA. #$%^&*!!! That's the way it goes, right? Showing Sonia her lifer Spotted Owl and Elegant Trogon surely softened the blow of that painful miss. As for other animals, we found Black Bear, Black-tailed Rattlesnake, Bobcat, Coyote, Coati, and the usual assortment of jack-rabbits and such. Plain-capped Starthroat - record shot. Not sure if he just caught the roadrunner! iPhone record shot of Black-tailed Rattlesnake on the road. These are very docile and often permit quite close approach. 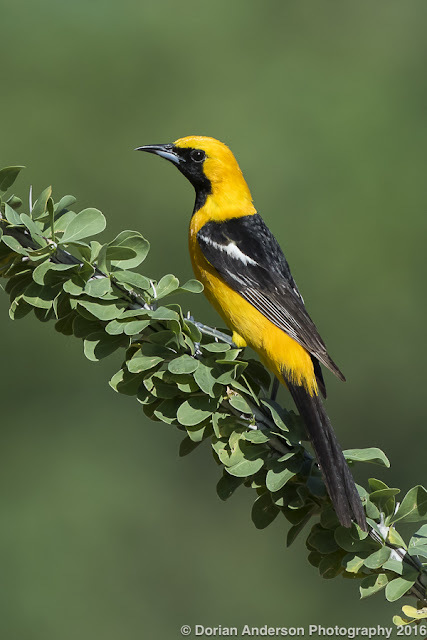 OK, with that I would like to propose what I think is the worst name for any North American bird. There are quite a few odd or awful names out there (American Black Duck - it's not even black, Hepatic Tanager - liver colored tanager?!?) 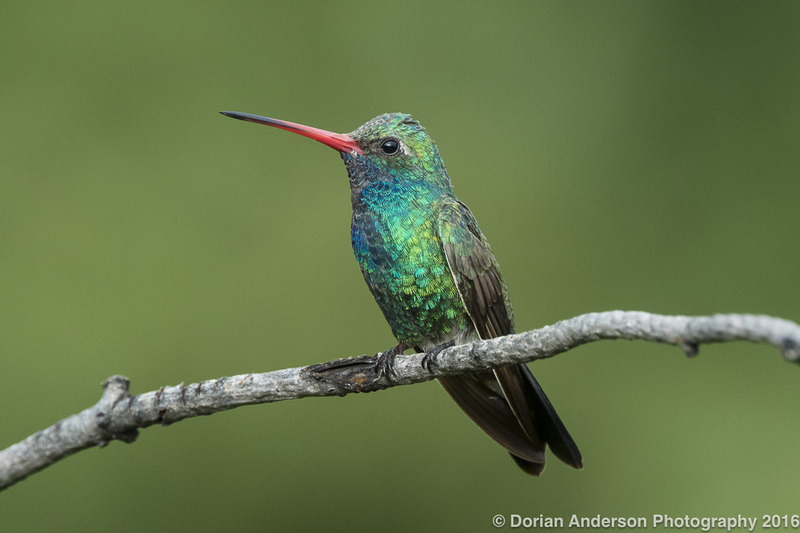 but Broad-billed Hummingbird does one of our most beautiful birds simply zero justice. I have no idea from where this oh-so-boring name came. Internet searches revealed some suggestions, but none really made much sense to me. 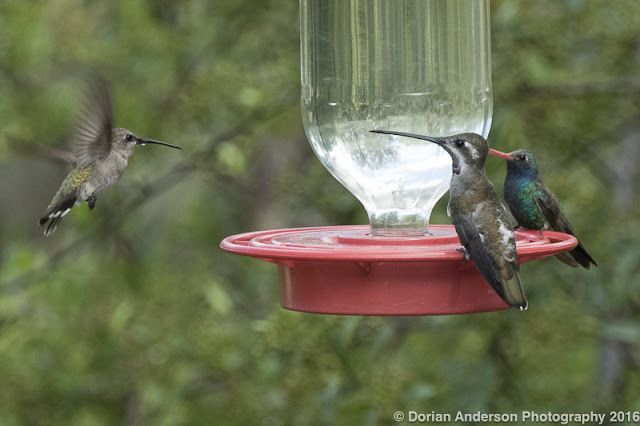 Blue-chested Hummingbird, Sapphire-chested Emerald, Fiery-billed Emerald, or Red-billed Gemstone would all be better monikers for this Central American species that reaches Southeastern Arizona in summer. I mean, c'mon, Broad-billed Humingbird? For real?!?!?! If anyone has other names that drives him/her crazy, I'd love to hear your thoughts via comments or emails. Anyway, that's my two cents for this post. There will certainly be more from AZ in the next few days, so please stay tuned!